Fine instruments have long been associated with the Yamaha brand name. 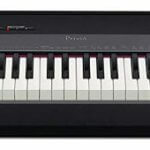 The P-115 is an upgrade from their earlier P-105 and is a fully weighted 88-key digital piano. It is pretty much standard fare in the Yamaha catalogue, but that doesn’t mean that you shouldn’t consider it. For an entry level instrument, with a few cosmetic changes from its predecessor, it still ranks high for quality and accessibility features and while it has some limitations with respect to more feature-laden instruments, it represents the best of Yamaha’s ongoing quest for perfection and functionality. Try it out for clean sound and sleek design. The standard for Yamaha entry-level digital pianos is their Graded Hammer action keys. These offer a well-balanced full weight on the keys that give the user a decidedly natural keyboard feel, being heavier toward the low end and lighter on top notes. The response of the keys feel natural, like those of a piano and react instantaneously allowing for virtuoso playing skills. The now standard, individual weighting setting, also gives users the option of a light to heavier feel across the graded action of the keyboard. This makes the keyboard great for those who feel their hands are weaker or for younger players yet at the same time it provides a satisfying playing feel for those who like their keys a little heavier. The keys were also not ‘clicky’ so there was a truly smooth response from them. The instrument features 14 voice options, two of which are new to the upgrade, the Wurlitzer and Rock-Organ. Its piano samples from Yamaha’s CF III concert grand give the keyboard some of the richest piano tones in a keyboard in this price class. The piano samples capture the rich tones of Yamaha’s best selling grand and offer a natural string resonance option which mimics the resonance in an acoustic instrument. This brings about the typical sympathetic resonance so noticeable in acoustic instruments. Added to the preset tones are 14 accompaniment rhythm tracks and these are very handily linked to an App that can be utilized to adjust volume and and tempo and save relevant settings. Yamaha moved the tweeter position to the top of the keyboard enhancing the spacious sound of the keyboard. With its upgraded 192 note polyphony, even the most complex virtuoso passages that require sustaining throughout can be executed with the natural response of an acoustic piano. The keyboard features an increased damper resonance response making for even finer natural sound when playing the piano tones. This is a big increase from the previous model which only had 128 notes. A new feature that is sure to become a standard amongst many brands and models is the use of an app that links to the keyboard. It allows you to save preset settings. It gives you a range of options for creating custom settings which can be recalled. The keyboard can be split and have two assigned voices. It also allows for a duo playing ability by splitting it into two equal pianos that can be played alongside each other. This is a nice feature for teaching young beginners, but limiting for any duet playing requiring too much range. There is also a layering function where individual voices can be set at their own particular volume. There are four reverb styles and one chorus effect which allow expression and tonal shaping of the presets. Keyboard: 88 graded hammer action keys with black matte finish. 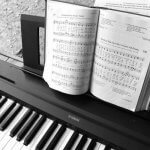 Styles: 10 pianist styles, 14 accompaniment presets. Recording: 1 song, 2 tracks, 11 000 notes. This is a super, simple to operate, entry level keyboard that offers a genuinely great sounding piano tone. It makes it ideal for those who can’t afford a classy acoustic instrument but don’t want a keyboard that sounds and feels less than the real thing. The graded action and damper response gives the user an authentic playing experience. The keyboard is also very reasonably priced and has an elegant feel and finish. It is a great instrument to use in a teaching environment, and offers excellent features for an entry-level instrument. When placed in its full stand with three pedals, it makes for a good-looking instrument that does not take up a huge space. Great news for those tiny apartments, if you are a musician. With headphone sockets as well you won’t be disturbing your neighbors any time soon either. The speakers deliver quite a nice full sound, without further amplification and this makes it a great portable keyboard for use in a variety of settings. Even outdoors it has some good sound capability for a smaller audience. The instrument only comes with a single pedal and this is limiting to further expression of complex pedaling found in some pieces. This can be remedied however if bought with the extra stand and three pedal unit, but again that makes it a little less portable. While the accompaniments are great to play along with the flexibility of these in terms of adjustment and creating a truly masterful performance are a little limiting because of lack of customization to the settings. I almost feel that Yamaha should leave this feature for more expensive models and then give it added flexibility as they do with their top end models. The keyboard is light at 11kg. It needs to be on a secure stand to avoid moving around as it easily slips on some stands because of its lighter weight. 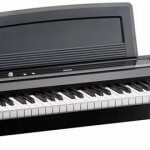 With many other digital piano brands meeting and sometimes exceeding the features on this model, Yamaha may have been a little slack in not pushing the boundaries of progress. Although the price is good, it may only be the name of the brand that saves this instrument, since the competition in this price bracket is quite fierce. All said and done though, the P-115 is a great starter instrument and probably one of the nicer options for teaching younger players, or learning to play. 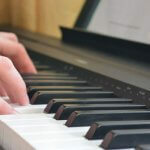 It is an easy keyboard instrument to learn on and learn about digital pianos in general. 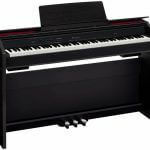 For more similar options, check our collection of digital piano reviews. If you like your digital piano, simple to operate, with great sound delivery and a well integrated pianistic feel, Yamaha do not disappoint. Overall this is a well designed, robust (albeit a little on the light side) instrument that gives great value for money.